Pool owners respond more intently to cloudy water than any other water-related issue due to its direct esthetic effect on the pool’s appearance. It can easily be identified by visual observation; any pool owner can recognize cloudy water and know it is an indication something requires attention. Where the difficulty lies for pool professionals, however, is diagnosing the specific problem and devising a solution that will adequately clear the water. Water cloudiness or turbidity is caused by the introduction of suspended particles that are invisible to the naked eye. A similar analogy would be the particles in the air that cause smoke. These impurities are introduced to the water via a myriad of sources. Essentially, any particulate debris that comes from the surrounding environment, (e.g. pollen, dirt, clay and silt, inorganic/organic matter, algae or microbial organisms) can contribute to cloudy water. Even bathers and source water can contribute to the problem. Consequently, swimming pools are constantly exposed to such contaminants and require proper maintenance to ensure a clean and safe swimming environment. Pool management systems prevent cloudy water through two distinct mechanisms—chemically (proper water balance) and physically (filtration). This article will discuss the causes of cloudy water as a direct result of system breakdown. The equation shows that pH, carbonate/calcium (Ca) concentration and water temperature each have an impact on the formation of calcium carbonate scale. The following sections discuss each parameter and their respective impact on cloudy water. pH is a measure of the water’s hydrogen ion concentration. It is the most important non-disinfectant balance parameter, as it has a significant impact on water balance and a direct correlation with turbidity. It is also the component around which all other parameters are balanced. Water is considered to be the ‘universal solvent,’ which means it will dissolve nearly any inorganic material until it reaches a point where it is satisfied. Satisfaction for a certain material is termed solubility, which has an inverse relationship with pH. This means water at a lower pH will have a greater capacity to dissolve minerals before satisfaction. The impact on cloudiness lies in changes in pH, rather than the particular pH value at any given time. For instance, if water reaches equilibrium at a certain pH, e.g. 7.2, but then rises to 8.0, the water will become oversaturated with dissolved minerals. The excess minerals will then become insoluble and precipitate out of the water as metal salts or metal oxides. Referencing the calcium carbonate equilibrium equation, a rise in pH will drive the reaction toward the precipitation of calcium carbonate scale. Once precipitated, the scale exists as small, suspended particulate matter (PM), which gives the pool water its cloudy appearance. The only way to remove the particulate is re-dissolution through reduction of pH or by physical removal via filtration. Total alkalinity and calcium hardness also play a factor in water balance and contribute to water turbidity. They are primary components that help buffer pH and maintain a mineral level that is sufficient in keeping the water satisfied and in a condition where it will not corrode other equipment components. Due to the fact calcium and alkalinity (AT) are maintained at such high concentrations relative to any other component in the water, calcium carbonate is the predominant equilibrium relationship in pool systems. Based on the equilibrium equation, the reaction is dependent upon concentration of calcium and carbonate ion (CO2-3) in the water. An increase in either component drives the reaction toward scale formation, much like a rise in pH. Insoluble calcium carbonate scale is formed, creating water turbidity. The third factor that significantly impacts calcium carbonate equilibrium is the water’s temperature. Unlike many other solutes, calcium is inversely soluble with water temperature. Due to the carbon dioxide (CO2) equilibrium component, this means the solubility of calcium decreases as the water temperature increases. The reason for this is warmer water volatilizes more carbon dioxide by gassing it off to the surrounding atmosphere, resulting in the formation of calcium carbonate scale. Although the concentration of hypochlorous acid (HClO) in the water has no impact on calcium carbonate equilibrium, a deficiency can impact water turbidity. Suspended solids do not have to be inorganic, they can also be biological. For instance, algae growth can significantly impact the cloudiness of water. If the pool water is in a chlorine demand situation, then algal or microbial growth is supported. Once these organisms colonize, they spread throughout the water causing it to appear hazy. If algae growth is supported for too long, the water takes on a green, swampy appearance, resulting in reduced visibility and large sanitizer demands. In these situations, the only way to reduce turbidity is to add enough sanitizer to break the demand and inactivate the micro-organisms. The dead algae and organisms must then be physically removed from the water through filtration or flocculation. Although improper chemical balance contributes to cloudy pool water, inadequate filtration is a more significant cause. Many different variables can impact the filtration system’s effectiveness; however, the consequences of each can be mitigated through proper maintenance procedures, which begin with adequate pump operation. Pump run time is an important factor in water clarity because pool water must be circulated (turnover) in order to obtain any filtration. Therefore, the amount of time per day the pool operator runs the circulation system directly affects the pool’s daily turnover rate. The turnover rate is measured by the length of time it takes to achieve one turnover. Inadequate pump run times will not apply enough filtration to sufficiently remove the contaminants contributing to cloudy water. 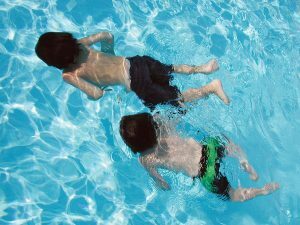 As a general rule of thumb, during the season its recommended pool owners operate the pump at least 10 to 12 hours per day. Running the pump less will limit the amount of water that is filtered and can lead to persistent cloudy water. According to the Gage-Bidwell law of purification by consecutive dilution, operating the pump longer than this will achieve better results; however, a trade-off exists for residential installations due to increased energy consumption. The law states that total removal of dirt and debris from pool water cannot be achieved by one turnover, but rather a series of consecutive turnovers is required. The reason for this is pool systems operate by principles of continuous dilution. Purified water that is returned to the pool constantly mixes with the bulk reservoir, continually diluting the suspended particulate in the water. Therefore, a portion of the water at the circulation system intake (skimmers and drain) has already flowed through and been purified by the filtration system. Gage and Bidwell’s study showed approximately 42 per cent of the dirt in an open pool, under constant exposure to contamination, will be removed by the end of the first turnover. Purification from subsequent turnovers will yield 84, 95, 98 and 99.3 per cent overall dirt removal after the second, third, fourth and fifth turnovers, respectively. To achieve 99.99 per cent removal, Gage and Bidwell found a total of 10 turnovers are required. Therefore, more contaminants are removed, as more turnovers are achieved. Another physical cause of cloudy water can be attributed to dirty filter media. As the media removes particles, its porosity is reduced and the space available for removing further debris gets used up. This reduction in porosity provides a temporary benefit, as it allows smaller particles to be removed as the diameter of the void channels decrease. However, this also places additional resistance to the system, increases the filter’s operating pressure and decreases flow rate. As a result, over time, the number of turnovers achieved is reduced. To avoid this, proper filter maintenance must be performed to ensure adequate filtration. Typically, filters should be backwashed or rinsed (according to media requirements) once normal operating pressure increases by 70 kPa (10 psi). In addition to routine backwash or rinse filter maintenance, the filter media should be cleaned periodically with chemicals. Aside from being dirty, the life of the filtration media can also negatively impact water clarity. In sand filters, for example, the rigid surface of the media aids in filtration by increasing the surface area available to remove microscopic particles from the water. Over time, however, the surface of the sand grain tends to smooth out through natural processes of erosion. And, as a result, the surface area for filtration decreases and filtration performance is affected. Alternatively, cartridge filters can also deteriorate over time. Therefore, these media should be replaced periodically. Channelling of sand filter beds is another issue. This occurs when there is an uneven flow of water above the filter bed’s surface. Essentially, water flows faster at certain points, which causes a channel to develop in the filtration media. These channels provide the least resistance to flow and thus become the modes of water transport through the filter. Once established, filtration is significantly diminished, as water flowing through the channels circulates through the system unfiltered. The only way to correct a channelling problem is to replace and regenerate the filter bed. 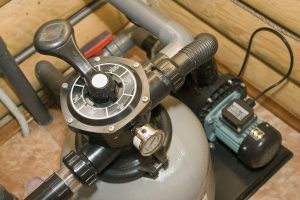 This makes it important for pool operators to ensure there is enough headspace above the filter’s sand bed to make sure a uniform flow of water goes through the filter. This is primarily an issue with sand filters, but can also be problematic with cartridge or diatomaceous earth (DE) filtration media. For instance, a tear in the fabric of the cartridge or a broken grid will also provide a channel for water to travel through the media without being filtered. Flocculation is a process where suspended particles, called colloids, come out of suspension in the form of larger particles. It differs from precipitation in that precipitation occurs where dissolved ions react to form an insoluble particle that falls out of solution. The impact on water quality occurs where turbidity is reduced due to removal of colloids from solution. However, it is important to note that flocculants or clarifiers do not remove the colloids per se; they simply prepare them to be removed by other means. It should also be noted that flocculants and clarifiers operate according to the same mechanisms, which means they essentially do the same thing. The difference within the industry is products that enhance filtration are generally called clarifiers, while products intended to drop a large amount of debris to the pool floor for vacuuming are generally called flocculants. To understand the mechanism of flocculation, the interaction between colloids in a solution should be appreciated first. For instance, the way various particles act in water depends largely on their charge. If the particles have the same charge, they are repelled from each other. Typically, colloids carry a negative surface charge, so they naturally repel. If the charge on the colloids is neutralized, they are free to agglomerate (collect) into larger particles upon collision, ultimately to settle out of solution. Flocculating agents and clarifiers operate to neutralize the charge of colloids. Alum, for example, reacts in the water to form aluminum hydroxide (Al[OH]3) salts. It has a positively charged surface, which absorbs the colloids’ negative surface and neutralizes their charge to allow for subsequent particle agglomeration. This reaction must take place in the presence of sufficient alkalinity in order to prevent the aluminum component from dissolving to form Al+3 ion, rather than reacting to form its aluminum hydroxide salt. In addition, the aluminum hydroxide is concurrently precipitating out of solution. Due to its very low solubility, aluminum hydroxide precipitates out of solution rapidly. As it precipitates, it settles to the pool floor collecting colloids in the process. This method of removing colloids, called ‘sweep floc,’ causes unorganized crystallization, which tends to trap additional metal ions in the structure, removing them from solution. Similarly, cationic polymers operate by the principles of charge neutralization. They consist of long polymer chains, with many positive sites from which to collect negatively charged colloids. As colloidal particles are connected, they grow into microflocs, which ultimately bridge to form flocs that are removed by the filtration system or fall to the bottom of the pool for further removal. As long as pools remain in existence, there will always be occasions when they turn cloudy. It is the pool professional’s job to prescribe the right treatment programs that will return the pool water to an inviting, pristine environment for the pool owner to enjoy. By understanding cloudy water is a symptom of a problem, rather than the disease, pool professionals will be able to ask targeted questions that lead to the right solution. The ability to provide a solution to customers illustrates the service company’s value as professionals, while also driving customer loyalty and sustainable profitability. This article was written by Karen Rigsby and Zach Hansen, and originally appeared on Pool & Spa Marketing [link].